Falklands Day on 14 August commemorates the first sighting of the Falkland Islands on that day in 1592 by the English explorer, John Davis, on board his 120 ton vessel 'Desire'. Davis (1550-1605) was one of the principal navigators under Queen Elizabeth 1. He came across the uninhabited islands of the Falklands, having been blown off course on an attempt to round Cape Horn through the Straits of Magellan. His account of this voyage was published in 1600 by Richard Hakluyt of London. Davis was born in Sandridge, Devon and owned a small house on the harbour shore of Plymouth, commemorated by the City Council with a blue plaque. Davis' sighting was followed by those of Sir Richard Hawkins in 1594 and of the Dutch explorer, Sebald de Weert, in January 1600. But the first recorded landing was not until 1690, when the English sea captain, John Strong, came ashore at Bold Cove near Port Howard from his ship 'Welfare'. Strong gave the name Falkland Sound to the passage between East and West Falklands after Viscount Falkland, then First Lord of the Admiralty. The Falkland Islands were not settled until 1764 (by the French) and 1766 (by the British). 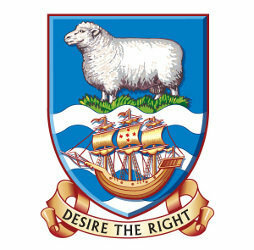 Davis' ship 'Desire' is featured prominently on the Falkland Islands coat of arms and in the motto: 'Desire the Right'.